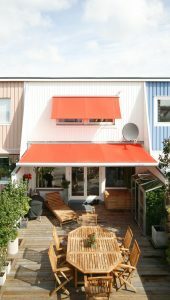 Awnings can be used for a variety of purposes. Choosing an awning for your home or business can be daunting at first. There are so many options, it can be hard to choose. Awnings can be used for a variety of purposes. Here are just a couple of the things a new awning from Carroll Awning can do for you. Awnings aren’t just for aesthetics. While they do enhance the look of your windows or entryway, they also provide shade that helps save energy and protects your furniture, flooring, and carpets from fading in the sunlight. You’ll notice the energy savings almost right away. Perhaps you don’t have to turn the air conditioning down as far, and you get a lower energy bill. That’s because your awning kept the sun out. On a hot day, more heat is transferred through a single square foot of glass than an entire insulated wall. In fact, sunlight is responsible for around 20 percent of the load on an air conditioner. Awnings and Canopies can offer protection from the sun, rain, snow, sleet and hail. The will direct rain away from the brick or siding surrounding your windows and doors. This will help protect the seal around them from the elements and help it last much longer, which saves you from having to make expensive repairs down the road. Awnings are built to withstand heavy winds and snow loads, although it is still important to remove snow accumulation whenever possible to help extend the life of your awning as long as possible. This also reduces the risk of heavy snow falling and hurting someone. Applying graphics directly to awning fabrics provides identification for your home. you can add your address on the front so you’re easily identifiable from the street. You can also print you initials or even a family crest, it’s totally up to you! Why not have a bit of fun with it? If you build an awning or canopy over your patio or deck, it can turn that outdoor space into an extension of your home. An awning provides plenty of relaxing shade and cover from rain, so you and your family and friends can enjoy the outdoors all summer long. Ready to get the perfect awning for your apartment building, business, or home? Carroll Awning Company has the expertise and equipment to make and install the perfect residential or commercial awning to give your home or business an even cooler exterior. We can design, create, and install custom canopies and awnings all year long. For a free estimate and to get started designing your dream awning, give us a call at 1-800-999-5617 or visit us online. To see examples of our work, follow us on Facebook, Twitter, Google+, and LinkedIn.